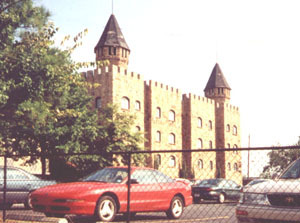 There is a castle in downtown Birmingham. It is called Quinlan Castle. It was built as the Nazi spy headquarters during WW II. It is brown stone from top to bottom, and basically looks like a fortress with turrets and everything. There is a courtyard inside the walls. At some point in time, Quinlan Castle had apartment units on the inside. There have been plenty of businesses that wanted to purchase the place (for the property), and tear it down. I think that the latest attempt at that may have been successfully blocked by some type of historical preservation society (???). At this point, it is my understanding that the place is vacant. Would love it if some historical society would take up the cause of restoring it on the inside. The outside still looks great after all these years. I think it's on 9th Ave S. and 21st St. on the Southside of Birmingham. I think that is an error about Quinlan Castle being built as a Nazi spy headquarters during WWII--I have never heard of that! Actually I think it was built about 1920 and it was my understanding that it was built as an apartment complex at that time. It is also known as The Royal Arms. It was saved from demolition and it is slated for renovation. I'll get back to you but I think the date is correct. The castle is huge and it stands prominently overlooking the city. In 1940 (ten years prior to the Communist witch hunts spearheaded by U.S. Senator Joe McCarthy), a Birmingham police lieutenant, Ollie F. Osborn, led a raid on the Quinlan Castle because it was rumored to be a "Communist Party headquarters." Robert Hall, then secretary of the Communist Party chapter in Birmingham, had an apartment there and in his room they found a letter from a TVA employee implicating communist activities in that federal agency. I would like to update you on Quinlan… Unfortunately, no one has bought it or done anything with it. It sits alone and unattended. I wonder if you could put the word out to people that it is still available. I can remember going and visiting a friend that used to live in it. It is such a great place and has such a wonderful feeling to it. It seems like such a shame to let it just decay. If any one gets it I would love to help restore it also. 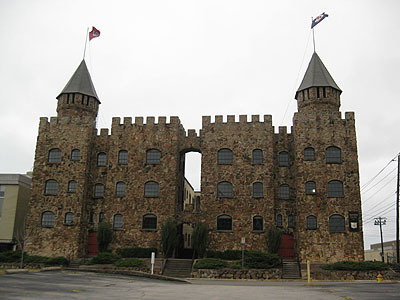 About Quinlan Castle in Birmingham, AL. I lived there years ago and have followed the restoration efforts over the years. A good source for info is www.bhamwiki.com. The following info is from that site. The future of the structure has remained in doubt due to its deteriorating state. By 1998, the structure was added to the Places in Peril list of the Alabama Historical Commission and the Alabama Trust for Historic Preservation. In the morning of February 26, 2003, a small fire broke out in one of its apartment units. The Birmingham Fire and Rescue Service ruled the fire an accident and stated that it was probably caused by vagrants. I am a paramedic and I regularly pass Quinlan Arms every time I transport to UAB Hospital that is close by. Here are some links with you pictures you might want to post on your site. I enjoy it very much as I do castles. A special thanks to Anne Rose for sending in the first photo and Addie Talley for the second.